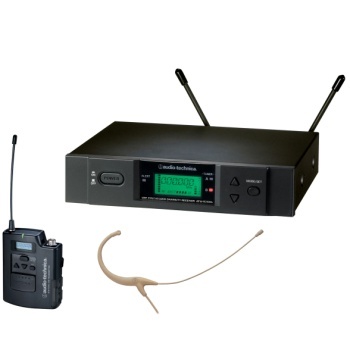 The ATW3192b-TH features an ATW-R3100b 1/2-rack size receiver and an ATW-T310b UniPak transmitter with a beige MicroSet omnidirectional condenser headworn microphone. A rackmount kit is included. Systems are available in three UHF frequency ranges: C Band (541.500 - 566.375 MHz); D Band (655.500 - 680.375 MHz) and the new I Band: (482.00 - 507.00 MHz). This is block C version.